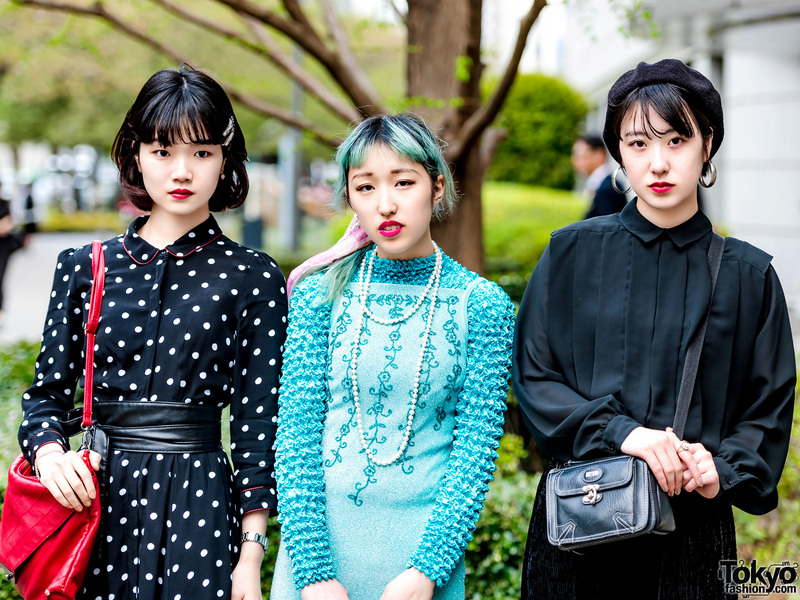 We me this trio of Japanese students – dressed in eye-catching black and aqua ensembles – on the street near Bunka Fashion College in Tokyo. At the left is Kanon, a 20-year-old student. She is dressed in a Zara polka dot long-sleeved maxi dress from with contrast red collar and cuffs piping. She paired the dress with black ankle booties from Emoda, a red leather sling bag, and accessories – from Cartier and Tiffany & Co. – such as pearl hair barrettes, a single heart earring, a black leather obi belt, a silver watch and silver bracelet. Kanon loves resale shops, and she enjoys listening to anime songs. Follow her on Instagram. Clad in aqua is 19-year-old Marincyorin. Her outfit consists of an aqua long sleeved popcorn pleat top, which wore under a glitter fabric spaghetti strap maxi dress with floral embroidery, bought at Funktique. 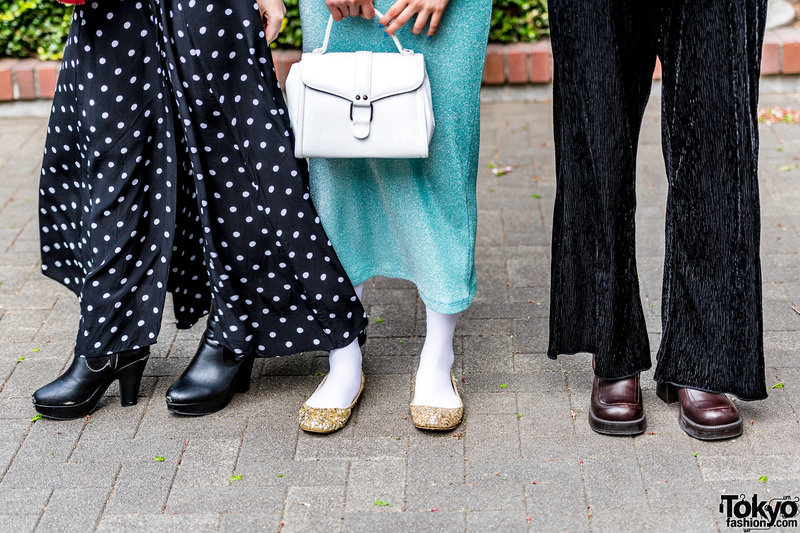 She finished off her look with white stockings, vintage metallic gold flats, a pink hair bow, a layered pearl necklace, and she is carrying a vintage white structured handbag. 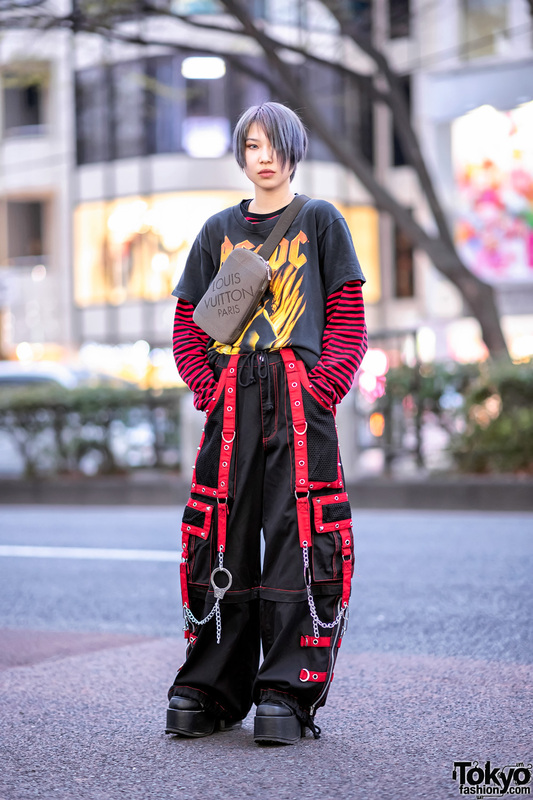 Marincyorin told us that her favorite brands are Pinnap, Funktique and Gucci, and that she listens to the music of Hatsune Miku. She is also active on Instagram. Meanwhile, sporting an all black ensemble at the right is 19-year-old Mio. They are clad in a vintage long sleeve pleated blouse, tucked into shiny micro-pleat pants, and paired with brown ankle booties from Funktique. 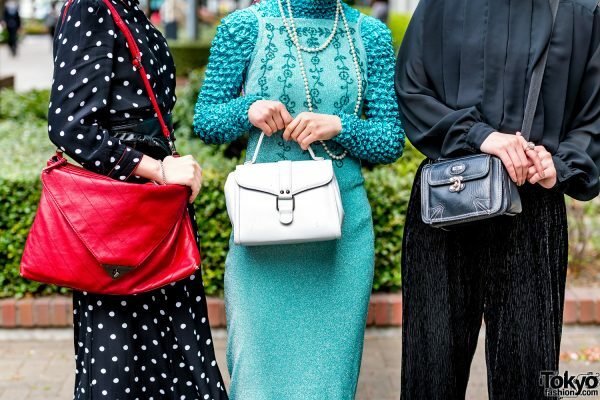 They accessorized with a black suede beret, silver hoop earrings, a diamond ring, and a black leather box sling from Funktique. Mio loves listening to the music of 13-member K-pop band, Seventeen. Follow Mio on Instagram.